1. Every trip consists of two simultaneous journeys: the outer journey and the inner journey. The outer journey is everything external: what you’re seeing, hearing, smelling, doing, etc. The inner journey is what’s happening in your mind. Great travel journals weave these two journeys together. 2. Take a few minutes to scan each of your senses. Don’t just focus on what you see. What do you hear and smell? What does your body feel like in this place? Look for the hundreds of minuscule details that surround you and make a place feel foreign. 3. Be brutally honest with yourself about the thoughts that pass through your mind. Sensitive travelers try not to judge a foreign culture. This is good, but culture shock is normal and inevitable. Don’t be afraid to acknowledge the things that make you uncomfortable. Then, ask yourself why these things make you uncomfortable. Your answers might surprise you! 4. “Show, don’t tell” is an old writing cliché… and it’s one of the most brilliant clichés ever concocted. Don’t just write that a market is “bustling.” Describe the vendors vying for your attention, the noises, the smells, the people who jostle against you. Don’t just write that a meal was “delicious.” How did your body react to the taste? What were the textures of the food? How did you feel when you were finished eating? What was the setting around you? Avoid vague adjectives, and look for specific details that define a place’s character. 5. Your journal doesn’t have to be a chronological play-by-play description of your day. Try choosing a different topic each day. It can be absolutely anything: transportation, children, language barriers and communicating, toilets, food, people’s clothese2C how you feel about money as you travel, accommodations, other tourists, etc. Write an essay each day about your encounters with that topic. 6. Try keeping a “people journal.” Write each day about someone you met that day. It can be someone you had a three hour chat with in a pub, or someone who spent 20 seconds selling you a bus ticket. Describe everything about them: How they looked, how they talked, their mannerisms, how they made you feel. Examine your “inner journey” as you talked with this person. How did you feel communicating with them? Why did you feel this way? In hindsight, how $o you feel about the way you felt when you were with them? 7. For many, the biggest challenge of travel journaling is finding time to write. Write during “hidden moments” in your day — waiting for trains or buses, waiting for a meal at a restaurant, waiting for your travel partner to finish showering. You’ll be surprised how many impressions you can jot down in three minute bursts. 9. Make journaling part of your travel experience, not something you do in isolation. Try taking a “verbal snapshot.” Sit someplace interesting and write about your immediate surroundings. Examples: at a café, a pub, a park, a museum, or standing on a street corner. 10. You don’t have to be traveling to try travel journaling. Try pre-journaling, post-journaling, and re-journaling. Pre-journaling is writing about your trip before you go. Journeys don’t begin when we step off the airplane. They begin the moment we start dreaming of going. Journal about your plans, hopes, expectations, etc. Post-journaling is writing about a trip after it’s happened. Again, try Natalie Goldberg’s timed writing exercises here. If you write fast without censoring your thoughts or editing your words-in-progress, you’ll be amazed how many memories and emotions come back. Re-journaling is taking a journal entry you wrote while traveling and journaling about what you wrote now that you’re home. Why did you feel the way you felt when you wrote it? How do you feel about the place or situation now? Watch how your attitudes change when you’re back in familiar surroundings. Thanks for your comments, everyone! And yes… when journaling for yourself, writing quickly and not overthinking things will help you capture far more details to trigger your memories later. 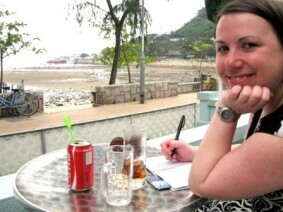 Personal travel journaling is very different from writing travel tales for other people to read. Polished travel tales take more time and finessing than we generally have on our journeys. I usually journal while traveling, then mold those “rough draft” notes into cohesive stories once I’m home. Thanks, everybody, for the kind feedback!